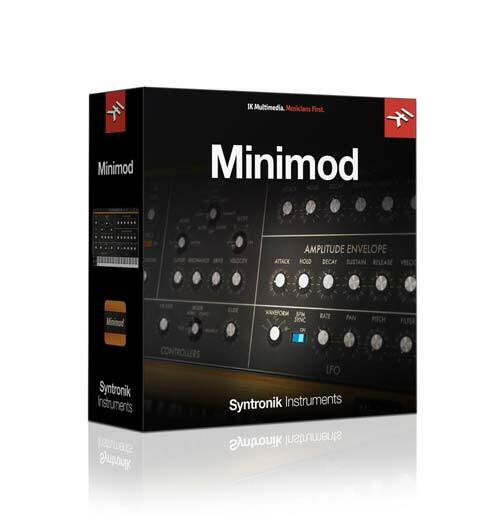 The Syntronik Minimod is based on the Minimoog Model D, Modular Moog and Moog Voyager. The modular Moog, or simply “Moog Synthesizer,” was the first commercially manufactured voltage-controlled music synthesizer. It was a truly “modular” instrument in that each system consisted of several independent modules – such as oscillators, filters, VCAs, mixers, even spring reverbs – that could be mixed and matched to create a truly custom instrument for the musician. The original Minimoog was designed to be a portable, pre-patched version of the gigantic modular synths Moog was producing. Three rich-sounding oscillators with selectable waveshape along with a noise generator are mixed together into the classic Moog 4-pole transistor ladder resonant low pass filter, generating some of the warmest and best analog synth bass, lead and whistle sounds ever like the instantly recognizable lead sound used by Rick Wakeman on “Catherine Parr”, from the album The Six Wives of Henry VIII. The Voyager was Bob Moog’s re-imagining of the Minimoog for the 21st Century. With a similar audio path to the 70s Minimoog Model D, the Voyager added more modulation routings along with a flexible dedicated LFO, and of course, program storage and MIDI. Throughout the years, the Minimoog has been used by legendary artists such as Rick Wakeman, Chick Corea, Depeche Mode, Tangerine Dream, Jean-Michel Jarre, George Duke, Rush, Toto, Keith Emerson, Yes, Vangelis, Pink Floyd, Joe Zawinul and Herbie Hancock.